Switch on the toastie machine and wait until it has come to correct temperature / make sure it's clean with no burnt bits from the last toastie. Cut your Creme Egg into small pieces. Place on a plate and pop it in the microwave for around 10 seconds, until consistency is plyable then mash a bit with a folk. Spread the butter on both pieces of bread on the outside only. Place the bottom slice of bread into the toastie maker, butter side down. 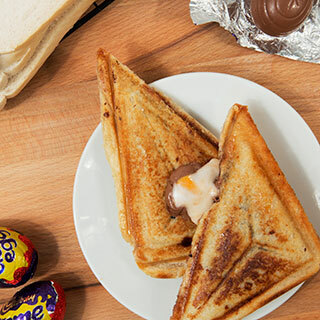 Add the partly melted Creme Egg onto the bread evenly over the piece. Place the second slice of bread on top (butter side up) and push down the toastie maker lid firmly, to secure in place. Cook in toastie machine until the bread is golden on the outside - this should take around 4.5 - 5 minutes. Keep checking on it as the length of time will vary depending on how hot the machine is. Carefully remove the toastie and place upside down - so that the most golden side of the toastie is facing up. Slice into 2 pieces on the diagonal, whilst cutting off any excess crust on the sides. 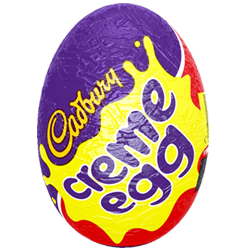 Make sure your knife does not have creme egg on it from a previous cut as this makes the knife sticky and cutting difficult.